Pier View Self Catering Luxury Apartment01702 437900work Self-cateringThis historic Georgian property is 2 minutes walk from the beach. In central Southend, with spectacular views of the iconic pier and estuary, these boutique one bedroom self-catering luxury apartments o?er free high-speed WiFi, 32-inch LCD televisions, a Blu-ray player, a music system and a kitchenette with a dining area. The apartments are set in a Grade II Georgian building, which retains its ambiance and historic character alongside modern features and comforts. The property has a beautiful communal lounge with views of the pier. There is also a laundry room with a washer/dryer for guests to use free of charge. The family-run apartments are located next to the high street in the historic conservation area and a 5-minute walk from Southend Central Train Station, with direct services to London. Central Bus Station is also 5 minutes away. This historic Georgian property is 2 minutes walk from the beach. In central Southend, with spectacular views of the iconic pier and estuary, these boutique one bedroom self-catering luxury apartments o?er free high-speed WiFi, 32-inch LCD televisions, a Blu-ray player, a music system and a kitchenette with a dining area. 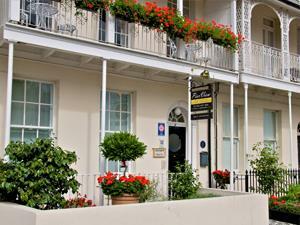 Situated in the centre of town & overlooking the sea. Pier View has easy access from the M25, A127 & A13. These Self catering apartments are situated approx 20 miles from jcn 29 off M25. Day time parking is pay and display and is available close to the property. Southend is served by two major train lines connecting the town with London (National Express and C2C lines). Southend Central is approx 5 mins walk to the property.